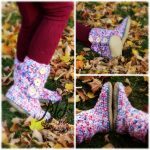 Happy Thanksgiving Weekend Canada! 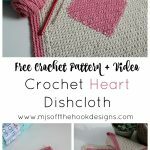 I’m so excited to put out a new Free pattern for you! 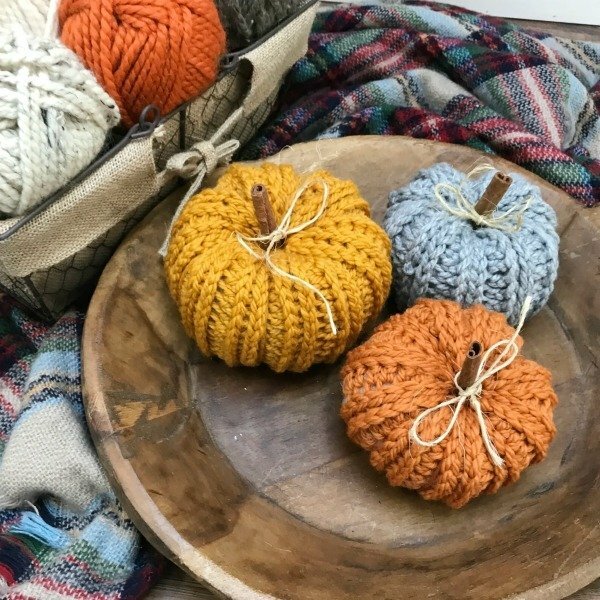 Read on to learn how to crochet these rustic farmhouse pumpkins. I’ve seen so many cute little pumpkins popping up in my feed lately that I finally decided jump in and make my own version. 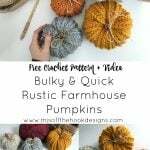 I wanted a rustic farmhouse pumpkin with a knit look. Definitely bulky and quick with lots of texture. 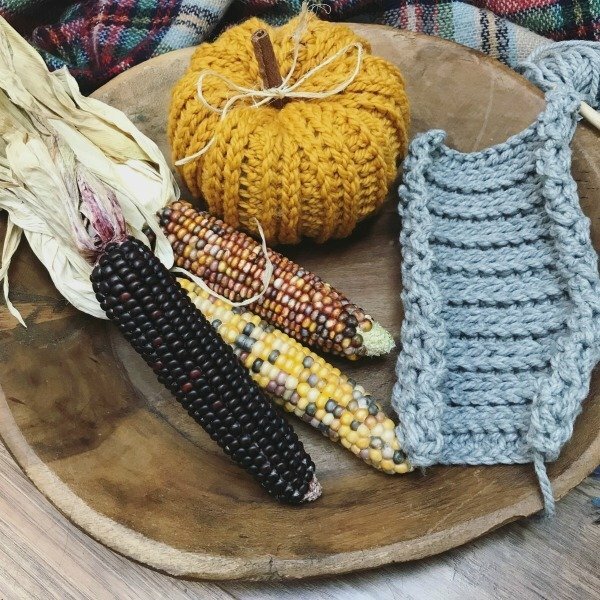 Our corn is getting combined as we speak and Fall decorating is in full swing! 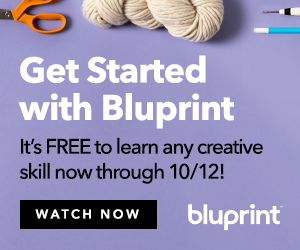 If you want to learn how to crochet our another creative skill click below to take online classes! Ok so lets get into it! 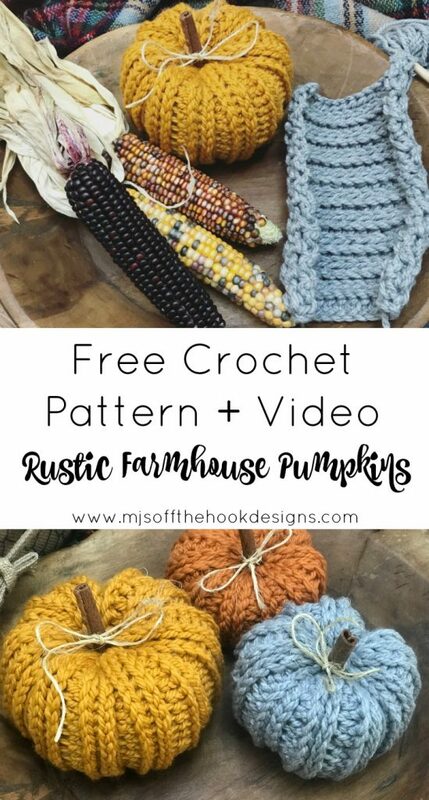 These pumpkins are sooooooo easy to make. 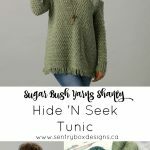 Work up a rectangle, seam it and sew your ends closed. That’s pretty much it! So read on for the deets. 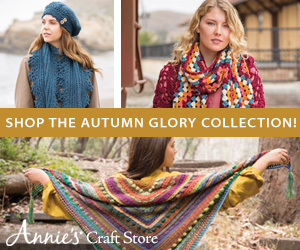 Special Stitches: To create this “knit look” you will work in the 3rd loop of the hdc stitch. The 3rd loop is located under the front and back loop of the the stitch. When working in rows you alternate between working in the 3rd loop (behind) and working in front (referred to as the first loop) watch our YouTube Video for stitch demonstration. Pumpkin is worked from the side across. Large rectangle is made as pictured below. Piece is then seamed and bottom closed. 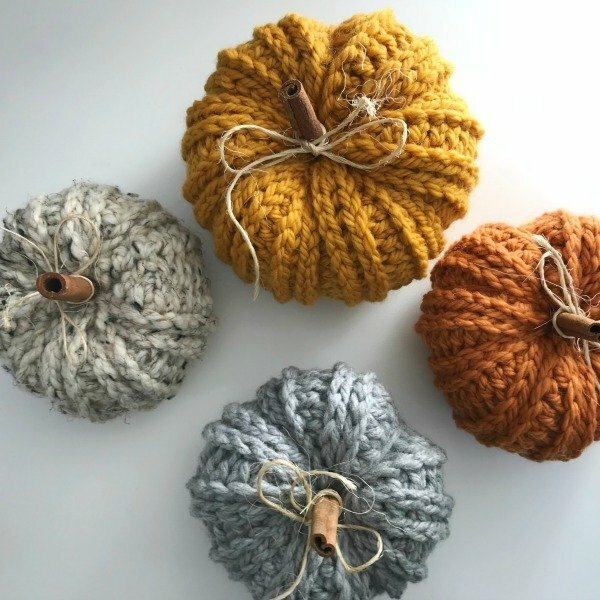 The pumpkin is then filled with polyester fibrefill and seamed closed. A cinnamon stick and twine is added to finish the look. Pattern is worked for small size with larger size in parenthesis ( ). Row 1: Ch 16 (22), work 1 hdc in the 3rd ch from the hook and in each ch across, turn—14 (20) sts. Row 2 (RS): Ch 2 (not included in st count here and throughout), work 1 hdc in the 3rd loop of each st across, turn—14 (20) sts. Row 3: Ch 2, work 1 hdc in the first loop of each st across, turn—14 (20) sts. Rows 4 – 19 (27): Rep Row 2 & 3 [ 8 (12) times]—14 (20) sts. After last row fold rectangle in half with RS facing. Sl st edges together. Flip seam to the inside. Ch 1, work 1 sc in every other row along edge. Sl st in the first sc to join. Fasten off leaving a long tail. With yarn needle, *weave through front loop of next 2 sts together; rep from * around. Pull pumpkin closed. Weave end, then weave back in the opposite direction. Don’t trim end. 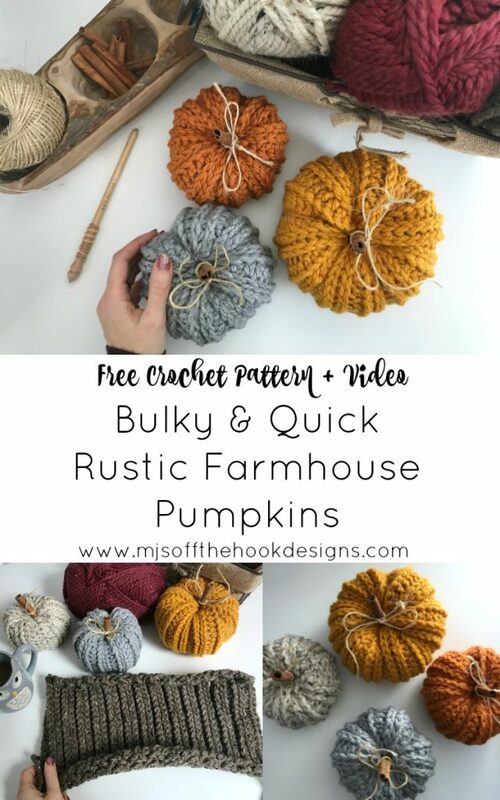 Stuff pumpkin with polyester fibrefill. Weave end up through the bottom of pumpkin pushing through the stuffing. Weave through every other row along top edge of pumpkin. Pull tight to close leaving a small hole open for cinnamon stick. Weave end, then weave back in the opposite direction. Don’t trim end. 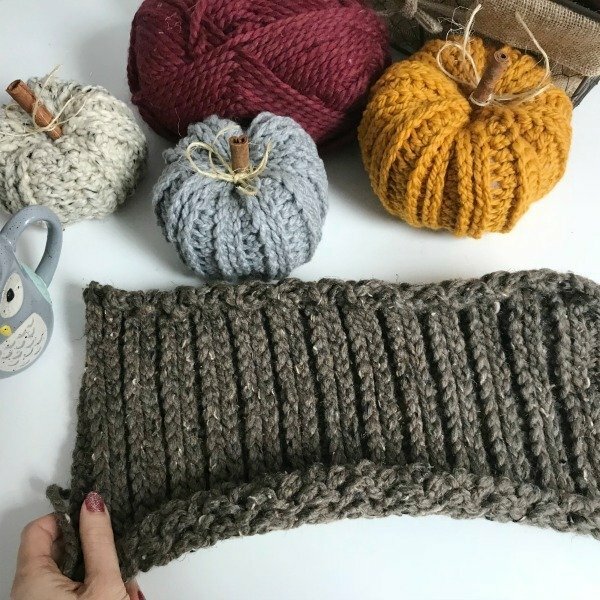 To give the pumpkin more definition and shape weave end down through ribbing. 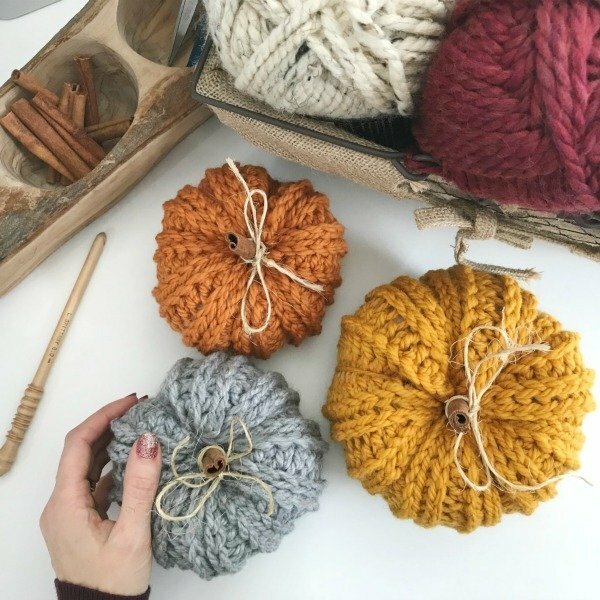 Push yarn needle through the bottom of pumpkin and back up through the top hole pulling to tighten (this will indent the pumpkin). Rep 4-6 times evenly around. Weave end and trim. Place cinnamon stick in the top hole of pumpkin. Tie a piece of twine in a bow around the base of the stick. Trim ends. Hashtag #mjsoffthehook to show us your pumpkins!